Okay, now that you have made this delightfully tasty but quite large leg of lamb from yesterday’s recipe, what the heck do you do with any leftovers? Sure you can make shepherd’s pie, which I have done in the past, and it is quite a tasty dish in its own right and makes good use of leftovers, but I wanted to try something different. There really aren’t a ton of uses for leftover lamb and it can get kind of tough and chewy if it is overcooked as it is, so I wanted to find something a little out of the ordinary that would not require a great deal of cook time for the lamb pieces. I received a cookbook, The Make-Ahead Cook, by America’s Test Kitchen, that came to my rescue right away. They had the solution of what to try with leftover lamb that I had never considered before – lamb shawarma. You have likely had or seen lamb shawarma at a Turkish or Mediterranean restaurant at some point in the past as you see this mass of meat rotating on a vertical rotisserie and the meat is gently sliced off from there to produce your dish.This recipe attempts to recreate the taste of that dish with the use of leftovers and a trusty skillet to get you through, and makes a really great yogurt-tahini sauce to go with it. For the yogurt-tahini sauce. combine the yogurt, tahini, lemon juice, parsley, garlic and 1/4 teaspoon of salt in a bowl. Season the mixture with salt and pepper to taste, cover the bowl and refrigerate it until you are serving the meal. For the lamb shawarma, Heat the vegetable oil in a large non-stick skillet set over medium-high heat until the oil is shimmering. Add the cumin, coriander, and cardamom and cook, stirring constantly, until the spices are fragrant and just beginning to brown, about 1 minute (be careful not to burn the spices!). Add the sliced lamb, breaking up any clumps, and cook until the lamb is just beginning to crisp, about 2 to 3 minutes. Take the skillet off the heat and stir in 2 tablespoons of the minced parsley and season with salt and pepper to taste. Spread 1/4 cup of the yogurt-tahini sauce in the center of each warmed pita, then divide the lamb mixture evenly among the pitas. Top each pita with some of the remaining 2 tablespoons of parsley, lettuce, tomatoes and shallots. Wrap the pitas around the filling and serve. This was really tasty and only took a few minutes to put together completely. The lamb gets barely any re-heating at all, just enough to get it hot and crisp, and it tastes great with all of those great Mediterranean spices that you use in the mix. Place it on a warm pita with the yogurt sauce and it was fantastic. I have to admit I was a little worried that Michelle and Sean would not go for it but we all loved it and gobbled it down pretty easily. This will certainly be my go to dish for leftover lamb from now on. 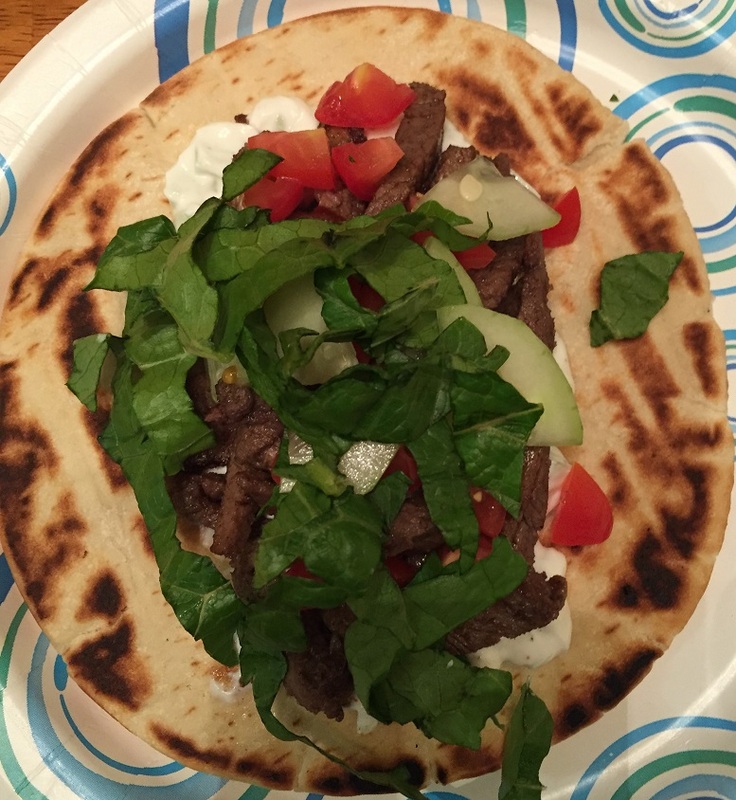 I did add some diced cucumber to the toppings of the pita to mix it all in for a bit of coolness and freshness to go along with the dish, and you could serve this simply with a side of rice or a side salad and have a great meal for lunch or dinner. You’re welcome! Glad it helps and thanks for the comment. Very tasty, too! Especially the sauce, I will be using it for other things as well.